Sidney Southern was the youngest of the eight children of William and Caroline nee Rainbow who were married at St Andrews Church on 17 January 1876. William was then a stoker, born in Rugeley in Staffordshire, his mother came from Pailton. Sidney was baptised at the same church on 9 March 1894, when his father was an engine driver living at 1009 Old Station. By 1901 the family still at home were living at No 3 Windsor Street, but had moved to No 77 by 1911. By this time Sidney was aged seventeen and working as an armature winder at BTH. His parents were at the same address when his gravestone was erected in the early 1920s. Sidney joined the Oxfordshire & Buckinghamshire Light Infantry as Private 11049, serving with the 5th Battalion. He must have enlisted near the outbreak of war as he was sent to France on 21 May 1915 according to his medal card. At the time of his death he was Private No 28905 with the Kings Shropshire Light Infantry attached to the 1st/1st Bn Herefordshire Regiment. While with the Ox & Bucks he was awarded the Military Medal, the award appearing in the Supplement to the London Gazette of 17 July 1917. This decoration was established in March 1916 by King George V to recognise outstanding bravery of soldiers in the field. 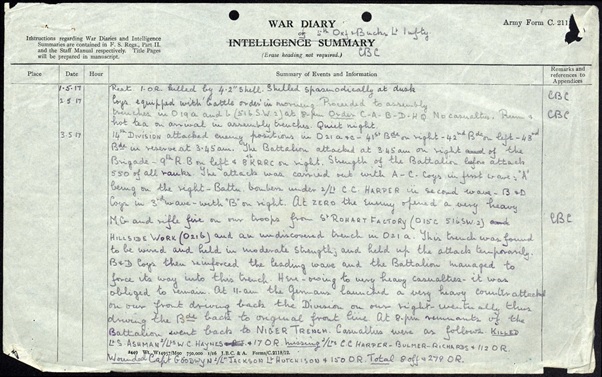 There is no mention of this in the Rugby Advertiser, but the war diary of the 5th Battalion for the period March to July 1917 records only one major engagement, on 3 May, when there was heavy fighting and shelling by both sides. Of the total strength of 550, 19 men of the Regiment were killed, 115 missing and 153 wounded, so it seems likely that Sidney was decorated for his actions on that day. It is probable that he was transferred to the KSLI after that regiment was decimated on 21 March 1918 at Lagnicourt during the German Spring Offensive. It was completely reformed under Lt Col Meynell, formerly of the Ox & Bucks, and ready to serve within ten days in the Ypres Salient, where it remained until the autumn. Sidney was killed in action in Belgium on 4 September 1918, and is buried at Wytschaete Military Cemetery, 7km south of Ypres. His mother Caroline received his back pay and a war gratuity of £18.10s. He was awarded the Victory and British War Medals and the 1915 Star as well as the Military Medal. This entry was posted in Biography and tagged 1918, Kings Shropshire Light Infantry, Oxfordshire and Buckinghamshire Light Infantry, Southern by Christine. Bookmark the permalink.